Cin City | [AD] Get Infected! Only 38% of mobile phones sold in 2010 (in Malaysia) were smartphones. What about the rest? Sometimes i think it may sound a lil’ selfish to talk about our Blackberry or iPhone as if the whole world is using them. Truth is, about 62% of people out there are still using normal mobile phones without internet plans. KOLONY is an SMS-based social network that connects you to your friends. Who needs a smartphone for that? It’s so awesome it’s gonna infect everybody (more than 1 million people are infected)! 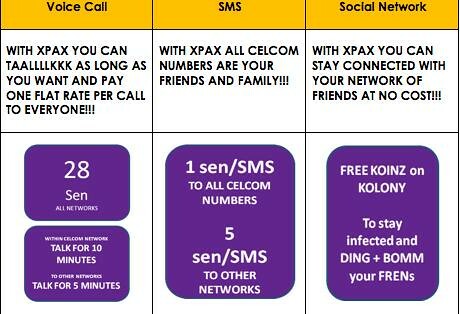 All you need to do is to get the NEW XPAX PLAN from any Blue Cube outlet or Celcom branch. You can DING your buddies to cheer them up, share an update by BOMM-ing it, POPP to comment on what your buddy says, and so much more. Just send KHELP to 25333 to get the full list of keywords you can use. This is me getting infected on a|x’s tiny blue phone. Anybody without a smartphone wanna join me? Send KFREN <fren’s nickname> to 25333 and start making as many FRENS as you can. great for those with normal phones!